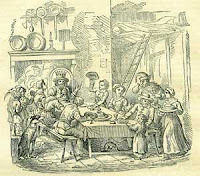 Two pictures, from 1869 and 1794, show celebrating Twelfth Night and the cakes. Sometimes called New York Cookies since several New York authors, including Washington Irving, included the imprinted cookies in their fiction. He wrote that Rip van Winkle was stamped on one side and St. Nicholas on the other of the cookies given out on January 1.